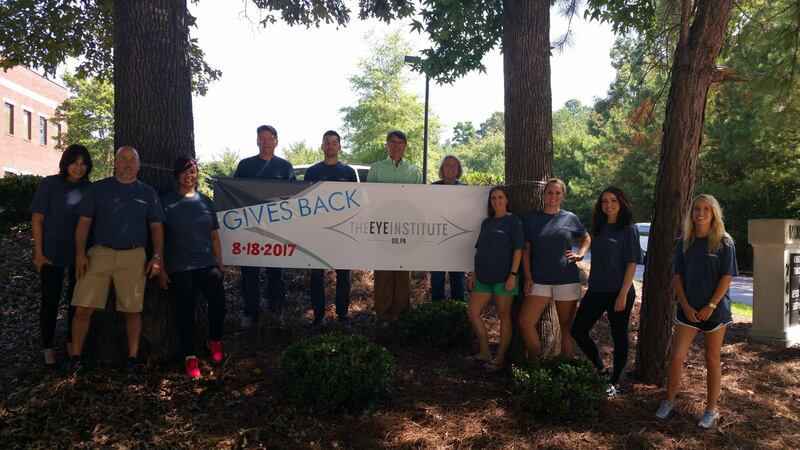 The Eye Institute believes in becoming part of the community. We also know that not every person who needs glasses and an eye exam can afford them. Every August, TEI hosts a “Give Back” Day. We offer free eye exams and a free pair of glasses to the first 100 people who walk in our door. We’ve hosted this event at our Knightdale location since 2011, giving away an estimated 800 exams and pairs of glasses. Our next event is October 5, 2018. Our team loves to see smiles on people’s faces as they put on glasses and see clearly for the first time! If you know someone who cannot afford an eye exam or glasses, please nominate him or her for a free exam and glasses any time of year. We accept nominations year round and will donate a free exam and pair of glasses once per month, based on justified need, at our discretion. Fill out the form below and tell us why that person qualifies. If selected, we will reach out to him/her and coordinate an appointment. * We may mention your name to the candidate unless otherwise notified in the essay section. Please provide an essay that explains in detail why this person is experiencing hardship, what their visual needs are, what their daily activities include, and why he/she is the ideal recipient of the free exam and glasses give back. I give permission for TEI representatives to contact me using this information. Yes, sign me up for the TEI monthly newsletter. By signing up, I agree TEI can send me monthly emails with news, offers, and other information. *TEI cannot guarantee each nominee will receive a free exam or glasses. Those who are chosen will receive a basic eye exam with refraction at one of our three locations.